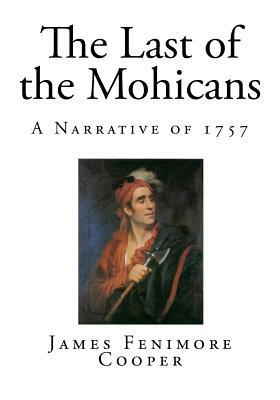 The World Classic Novel Complete new Edition The Last of the Mohicans A Narrative of 1757 by James Fenimore Cooper The Last of the Mohicans: A Narrative of 1757 (1826) is an historical novel by James Fenimore Cooper. It is the second book of the Leatherstocking Tales pentalogy and the best known to contemporary audiences. The Pathfinder, published 14 years later in 1840, is its sequel. The Last of the Mohicans is set in 1757, during the French and Indian War (the Seven Years' War), when France and Great Britain battled for control of North America. During this war, both the French and the British used Native American allies, but the French were particularly dependent, as they were outnumbered in the Northeast frontier areas by the more numerous British colonists. According to the Encyclopedia of Media and Propaganda in Wartime America, the novel has been one of the "most popular novels in English" since its publication and it remains "widely read in American literature courses." It has been adapted numerous times and in different languages for films, TV movies and cartoons. At the time of Cooper's writing, many people believed that the Native Americans were disappearing, and would ultimately be assimilated or fail to survive. Especially in the East, their numbers continued to decline. At the same time, the author was interested in the period of the frontier of transition, when more colonists were increasing pressure on the Native Americans. He grew up in Cooperstown, New York, which his father had established on what was then a western frontier of settlement; it developed after the Revolutionary War. Cooper set this novel during the Seven Years' War, an international conflict between Great Britain and France which had a front in North America. Also known on that continent as the French and Indian War, the conflict arrayed British colonial settlers and minimal regular forces against royal French forces, with both sides also relying on Native American allies. The war was fought primarily along the frontiers of the British colonies from Virginia to Nova Scotia. In the Spring of 1757, Lieutenant Colonel George Monro became garrison commander of Fort William Henry, located on Lake George (New York) in the Province of New York. In early August, Major General Louis-Joseph de Montcalm and 7,000 troops besieged the fort. On 2 August General Webb, who commanded the area from his base at Fort Edward, sent 200 regulars and 800 Massachusetts militia to reinforce the garrison at William Henry. In the novel, this is the relief column with which Monro's daughters travel. James Fenimore Cooper (September 15, 1789 - September 14, 1851) was a prolific and popular American writer of the early 19th century. His historical romances of frontier and Indian life in the early American days created a unique form of American literature. He lived most of his life in Cooperstown, New York, which was established by his father William. Cooper was a lifelong member of the Episcopal Church and in his later years contributed generously to it. He attended Yale University for three years, where he was a member of the Linonian Society, but was expelled for misbehavior. Before embarking on his career as a writer he served in the U.S. Navy as a Midshipman which greatly influenced many of his novels and other writings. He is best remembered as a novelist who wrote numerous sea-stories and the historical novels known as the Leatherstocking Tales. Among naval historians Cooper's works on the early U.S. Navy have been well received, but they were sometimes criticized by his contemporaries. Among his most famous works is the Romantic novel The Last of the Mohicans, often regarded as his masterpiece.